According to the British newspaper “Daily Telegraph” ranking the most impressive subway station of the old continent is the Toledo metro station of Naples, opened in 2012 and situated under one of Naples’ main shopping streets. Toledo is the deepest metro station on Naples’ line 1, with its depth of 50 meters. Designed around themes of water and light, this station has colors that symbolically mark the passage from earth to sea. 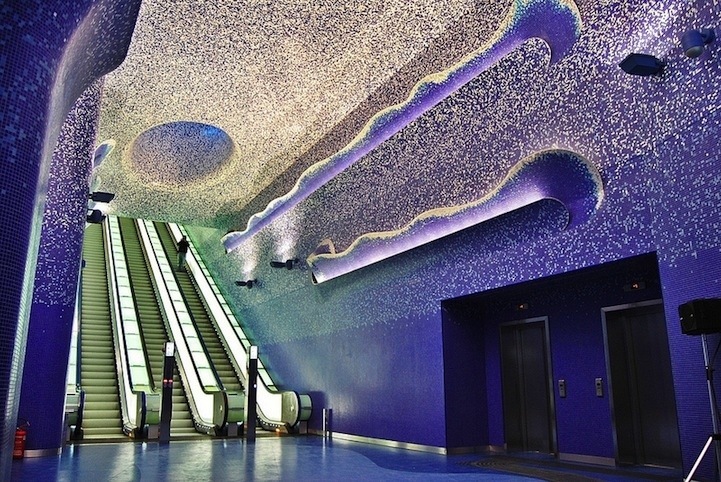 Created by the famous Catalan architect Oscar Tusquets Blanca, the station ranks as a gem of the renewed Naples’ urban landscape within the project “Stations of the Art”. This underground network combines the efficiency of public transport to the contemplation of art. The Art Stations, distributed along the lines 1 and 6 of the Metro network, include more than 180 pieces of art created by 90 international authors and by some young local architects, and feature different architectural styles. At various stops you can admire contemporary art works of renowned artists and architects, such as Oliviero Toscano, Laurence Weiner, Emilia Kabakov, Francis Cle, etc..During the excavation of the Toledo station there were several archaeological finds, including pottery fragments dating back to the Neolithic and some Aragonese walls. They have been restored and integrated in the station and complemented by contemporary works of art, such as large mosaics by the artist William Kentridge and the fascinating gallery of the Sea by Robert Wilson. The connection between interior and exterior space is given to the structure from a road skylight, a spectacular “crater of light” that links the surface level to the large hall 38 meters below. In the ranking we find the Komsomolskaya in Moscow in the second place, the Solna station in Stockholm in the third place and the Materdei station in the sixteenth place, with its colorful glasses and mosaics, again in the Neapolitan metro network.